I ask myself this question a lot as a short story writer. As someone who has studied creative writing, held multiple editorial internships, and is now pursuing a career in publishing, I’m no stranger to the old adage that first time authors shouldn’t try and write a short story collection. Because, simply, short story collections don’t sell. Any smart first-time author will write a novel, then try and place their short story collection. I’m baffled by this concept because I love reading short stories–Raymond Carver, John Cheever, Alice Munro, send them my way. Short stories are accessible. I can read one on the bus and not have to stop at an awkward spot in the story when I reach my destination. Plus, the craft of writing a short story takes a lot of skill. Saying a lot with a little is hugely challenging. Don’t get me wrong, I believe crafting a novel is an important accomplishment (I’ve tried it once—it was daunting), but writing a short story takes another set of skills that shouldn’t be under-appreciated. Last month, I wrote a blog post about an old Ooligan Press title, You Have Time for This. The book is a collection of flash fiction. The rules for flash fiction vary, but in the case of this collection, every story had to be 500 words or less. The book included stories by Steve Almond and Aimee Bender, who especially rose to the challenge with a sad fairy tale that was only two paragraphs long. The editors of this book truly believe that good stories don’t have to be long. It’s amazing what you can do with a few pages. Think of Fitzgerald and Hemingway–weren’t their short stories just as powerful as their novels? Maybe I’m writing this because I need to remind myself that it’s okay to be a short story writer. 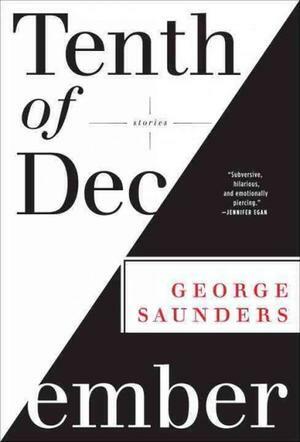 If anything, I should take hope from George Saunders, whose latest short story collection, Tenth of December, currently ranks number 13 on the New York Times Bestseller List (ranking under Nicholas Sparks and the Fifty Shades books, but that’s a rant for another time). Saunders is perhaps the strangest short story writer I’ve ever encountered. I read my first story of his last week in preparation for his reading at Powell’s. The story, “The Semplica Girl Diaries,” tells the tale of a somewhat happy, somewhat sad middle-class father and husband who often finds himself down on his luck while trying to scrape by. This is expected realist fare, except that the way people show their wealth in this story is by hiring young girls with wires running through their heads (attached to other young girls, naturally) to live in their yards. He weaves this strange, sci-fi aspect into his dramedy without apology, and it somehow works. His characteristic wit and humor don’t hurt, either. When I heard him read last week, I may have laughed more than I ever had at a reading. Saunders was a celebrity to the packed room of lit nerds. During the Q&A, an audience member asked how he felt about the novel being “supreme” and if was difficult to write short stories because of that. Saunders, very eloquently responded that he had tried to write a novel in the past because he thought that was what he was supposed to do. Eventually, he realized the story will become the length it is supposed to be. You can’t force a lengthy on the story; you can only tell it the way it’s supposed to be told.